If you have any questions or suggestions you are welcome to join our forum discussion about Further Talk on Failed Patterns. Very often you will see long trends forming a trading range in its late phase, in many cases a flag that is several bars wide, which accelerates in the with-trend direction towards a new trend extreme and then reverses, very often transiting into a trend reversal. This type of market behavior is called a Failed Final Flag and usually precedes the end of a trend. The pattern can also consist of only one or two very large bars, instead of a longer trading range, but the outcome is the same. In most cases it is followed by a two-legged counter-trend setup, which can last for more than an hour, and is tradable. Although it is a counter-trend correction, the following move does not necessarily, and more important reliably, lead to a trend reversal, thus further confirmation is needed. 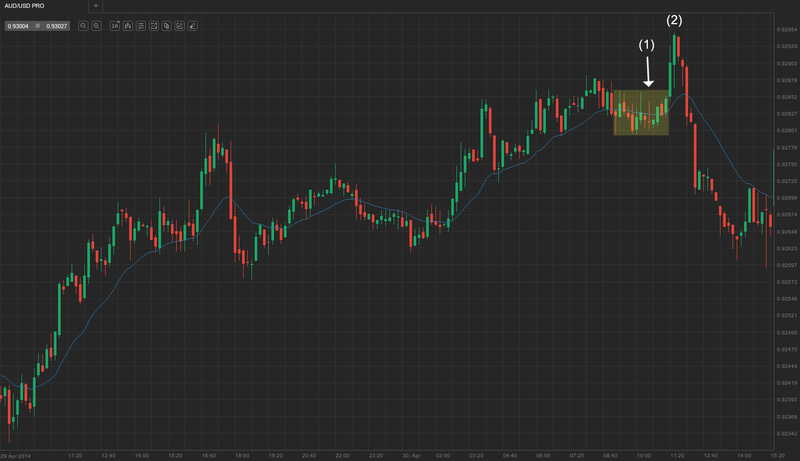 The market formed a trading range in the late phase of a strong trend which continued for more than ten hours. The trend channel line was broken two times, which however did not lead to a faster-than-expected acceleration of the trend, whose momentum was contained within the channel. However, the first signs of trend exhaustion came as the market entered a 7-bar-long trading range, indicating bears were ready to make a stand and this could be a failed final flag. The price broke up of the trading range with a huge top-shaved bull trend bar, and a buy climax, because many bulls saw the breakout as a trend continuation sign. However, as most of them considered the newly hit day’s high as a suitable point to lock in profits, and smart shorts entered as they figured they can profit from longs that would remain trapped in, the market reversed. The counter-trend move after failed final flags is usually at least two-legged. Bulls attempted to regain control, as evident by the big doji bar at (1). However, bar (1) was more likely still part of the first leg, not its end, which continued up to bar (2), followed by the second leg down to bar (3). 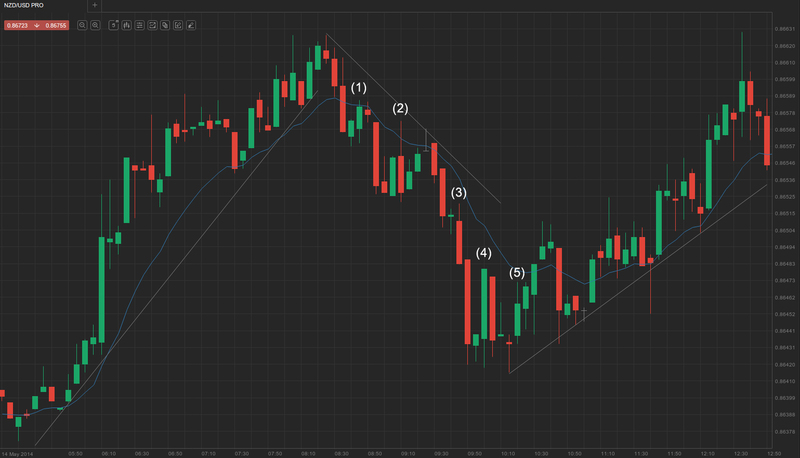 Occasionally, the reversal after a failed final flag just makes the pattern grow into a larger wedge-shaped flag. In a bullish trend for example, the first leg of the wedge is the failed final flag, the second leg is the bar, which reversed the market, and the other bars of the wedge are the sell-off after the reversal. Upon its formation, the wedge can either become a larger failed final flag and be followed by a reversal, or it can be a continuation pattern (a larger bull flag). As we said before, in some cases a failed final flag can be comprised of one or two large trend bars, instead of a trading range running for several bars. 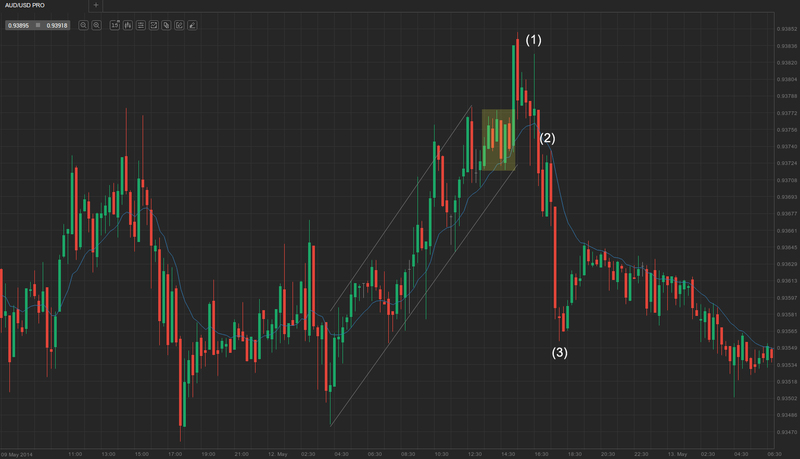 This scenario can be observed during strong trends, which move fast and with large trend bars. As with the previous variety, the price breaks out from the small flag, often undershooting or overshooting the trend’s extreme, and then reverses with a two-legged counter-trend move. As you can see on the screenshot above, the market was in a very strong and protracted bullish trend for almost a full day and formed a “barbed wire” trading range in its late phase, sounding the alarm for smart traders to be cautious with their next with-trend entries. The price broke up out of the trading range, accelerating past the recently-hit trend extreme and marking a new session high. The strong breakout from the trading range was a two-legged move, with the first leg ending at bar (1), and the second leg ending at bar (2). Two-legged moves out of flags in many cases set up major reversals. This effectively became a failed final flag and was expected to be followed by at least a two-legged move down. The first leg was comprised of five bear trend bars, the last one of which effectively a sell climax, which was paused by a short rally, followed by another drop to a swing low that ended with a consolidation in a trading range. We’ve already discussed in the articles “Counting Bars in Order to Detect End of Corrections” and “Pullbacks in a Strong Trend – One of the Most Profitable Trades” that the High 2 and Low 2 setups are among the best performing with-trend setups. This is because they basically mark the end of two-legged pullbacks (during a pullback in a bull trend for example, the High 1 is the first bar whose high extends above the previous bar’s high – effectively the end of the first leg; respectively High 2 is the second bar during the downward move, whose high is above the high of the previous bar, thus signifying the end of the second leg, and as we know the market usually makes two-legged movements). However, this pattern occasionally fails and the correction usually extends for two more legs, up to High 4, or respectively Low 4. If the price then again fails to rebound, there is a very good chance that the pullback has actually become a new trend. That said, traders must proceed with caution, if a High/Low 2 setup fails and the correction extends for two more legs, but they should not refer to counter-trend positioning just yet, until a major trend line is broken. If the High/Low 4 setup fails, and the price accelerates through a major trend line, then it is highly possible that the market has reversed into a new trend and traders should switch to opposite positioning. On the screenshot above you can see a failed High 2 visualized. A very strong bullish trend which hadn’t pulled back to the 14-day EMA eventually overshot it, and a common acceleration towards a new trend extreme followed. The market then pulled back and broke the major trend line. You can see that the High 2 was reached during a with-trend bar, which carries a higher chance of failure of the pattern and continuation of counter-trend movement. The prior bar was a strong, almost double-shaved, bull trend bar, and as the High 2 bar opened at its close, there was not enough buying pressure to sustain a close above the moving average. The market found itself in a small trading range, resembling a barbed wire, and a downward breakout followed, thus rendering the High 2 setup failed. High 3 and High 4 followed, and although the pullback did not end with High 4, rather High 5, it can still be deemed as overall successful.